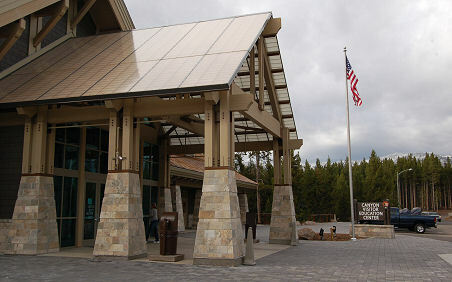 Although smaller in services than some of the park's other information centers, the Canyon Village visitor center is a popular stop for Yellowstone visitors. It serves as the gateway to the park's stunning "Grand Canyon of the Yellowstone," a 1,000-foot-deep chasm of red, orange and rust-colored Rhyolite lava that was carved approximately 10,000 years ago. Numerous trails meander through the Canyon area, providing stunning views of the gorge from both its north and south rim locations. The Canyon area is also a nesting area for osprey, which can be observed from several viewpoints along the trails. One of the park's newest visitor centers, the Canyon Visitor Center mirrors the public-use architecture that was reminiscent of the late 1950s and early 1960s and was a hallmark of Yellowstone's Mission 66 upgrade project. 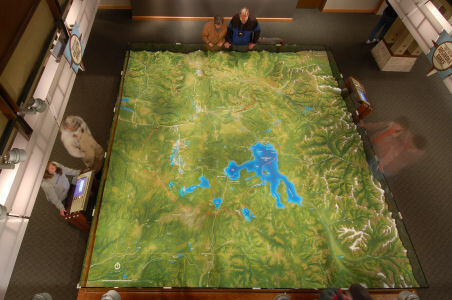 The building houses a large Yellowstone Association bookstore and has been a presentation area for a number of traveling exhibits over the years. An ongoing exhibit about the history and ecology of Yellowstone's bison is on site and there are plans to install a geology exhibit in the future. There is currently no audiovisual exhibit on site. Canyon Village is equipped with a lodge that offers rooms and cabins, a camping area, laundry, a cafeteria, deli and lounge as well as guided tours. 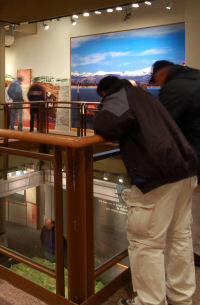 The visitor center is open from early June through September.